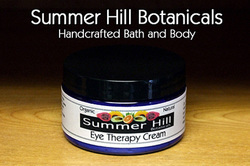 Hyaluronic Acid Eye Therapy Cream - Summer Hill Botanicals. Est. 2006. Custom Handcrafted Bath & Body and Natural Skin Care. Everyone can use a little help in the eye area. Years of squinting from being in the bright sun and every day abuses from the elements in our world. Just smiling helps to create those lines around our eyes. We all need to smile so keep smiling! This This Eye Therapy Cream will help to reduce those fine lines and wrinkles without the use of artificial ingredients. Let nature be your remedy for growing older. We'll still have lines and wrinkles but let's have less of them. Aloe Vera, Cucumber extract and Prickly Pear are the main components of our Eye therapy Cream. Moisturize with a non-greasy cream that can be used day and night. Cucumber to help with the puffiness. Green Tea and Caffeine to help with those dark circles. There is nothing artificial in this and it contains Vitamins A, C, E, F and keeps the skin around your eyes healthy. Also rich in Linoleic Acid that helps in cell repair. Maintains and restores skin's natural elasticity and helps to rebuild lost collagen.